The workhorse open economy macromodel suggests that capital inflows are contractionary because they appreciate the currency and reduce net exports. Emerging market policy makers, however, believe that inflows lead to credit booms and rising output, and the evidence appears to go their way. To reconcile theory and reality, we extend the set of assets included in the Mundell–Fleming model to include both bonds and non-bonds. At a given policy rate, inflows may decrease the rate on non-bonds, reducing the cost of financial intermediation, potentially offsetting the contractionary impact of appreciation. We explore the implications theoretically and empirically and find support for the key predictions in the data. *Olivier Blanchard at Peterson Institute for International Economics, email address is: OBlanchard@PIIE.com. Jonathan D. Ostry, Atish R. Ghosh, and Marcos Chamon from the Research Department at International Monetary Fund, their email addresses are: jostry@imf.org, aghosh@imf.org, mchamon@imf.org. We are grateful to Charles Engel, Emanuel Farhi, Luca Fornaro, Jeffrey Frankel, Joe Gagnon, Pierre-Olivier Gourinchas, Sebnem Kalemli-Ozcan, Maurice Obstfeld, Mahvash Qureshi, and seminar participants at The Role of Central Banks in Modern Times: Twenty-Five Years into the Central Bank of Chile’s Independence Conference, the Central Bank of Brazil XVIII Inflation Targeting Seminar, and the Swiss National Bank, International Monetary Fund and IMF Economic Review Conference on Exchange Rates and External Adjustment for useful comments, and Eun Sung Jang, Anne Lalramnghakhleli Moses, and Chifundo Moya for excellent research assistance. The views expressed in this paper are those of the authors and do not necessarily represent those of the IMF, or its policies. The online version of this article (doi: 10.1057/s41308-017-0039-z) contains supplementary material, which is available to authorized users. The source for the capital flow variables is the IMF Financial Flow Analytics (FFA) database, whose underlying data primarily draw upon the IMF Balance of Payment Statistics Database, BPM version 6. Flows are measured in gross terms (net purchases or sales of domestic assets by foreign residents). Bond Flows: Balance of Payments, Financial account, Portfolio investment, Debt securities. Equity Flows: Balance of Payments, Financial account, Portfolio investment, Equity and investment fund shares. FDI Flows: Balance of Payments, Financial account, Direct investment. Other Flows: Balance of Payments, Financial account, Other investment, Non-official sector. Net Reserve Flows: Balance of Payments, Financial Account, Reserve Assets. The capital flows are measured in current dollars and are scaled by the Nominal GDP in Dollars in that year. Additional variables used: MSCI Equity Index, 10 Year Benchmark Government Bond Yield, and 1 Year Benchmark Government Bond Yield (from Bloomberg). GDP Volume (from International Financial Statistics, IFS). Partner Growth: Real GDP (2005 constant local currency prices) of partner countries weighted by export shares (from World Economic Outlook, WEO). Terms of Trade (from WEO). Domestic Credit to the Private Sector (from World Development Indicators). Policy Interest Rate (from IFS). For countries where the policy interest rate (or equivalent) is not available, we use the discount rate and where that is not available the money market rate. 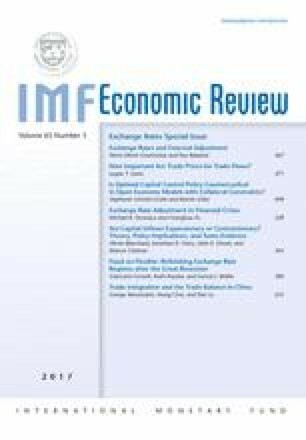 International Monetary Fund, 2012, “The Liberalization and Management of Capital Flows: An Institutional View.” http://www.imf.org/external/np/pp/eng/2012/111412.pdf.